Background: PXR (Pregnane X Receptor) and CAR (Constitutive Androstane Receptor) are termed as xenobiotic receptors, which are known as core factors in regulation of the transcription of metabolic enzymes and drug transporters. However, accumulating evidence has shown that PXR and CAR exert their effects on energy metabolism through the regulation of gluconeogenesis, lipogenesis and β-oxidation. Therefore, in this review, we are trying to summary recent advances to show how xenobiotic receptors regulate energy metabolism. Methods: A structured search of databases has been performed by using focused review topics. According to conceptual framework, the main idea of research literature was summarized and presented. Results: For introduction of each receptor, the general introduction and the critical functions in hepatic glucose and lipid metabolism have been included. Recent important studies have shown that CAR acts as a negative regulator of lipogenesis, gluconeogenesis and β -oxidation. 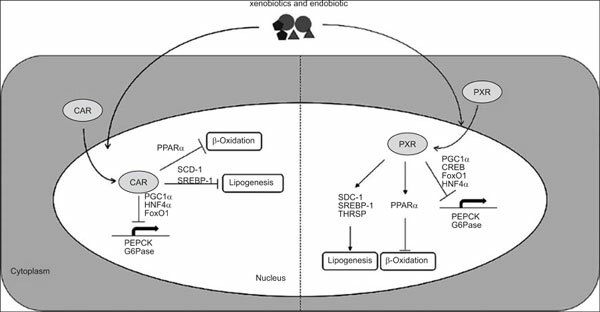 PXR activation induces lipogenesis, inhibits gluconeogenesis and inhabits β-oxidation. Conclusion: In this review, the importance of xenobiotic receptors in hepatic glucose and lipid metabolism has been confirmed. Therefore, PXR and CAR may become new therapeutic targets for metabolic syndrome, including obesity and diabetes. However, further research is required to promote the clinical application of this new energy metabolism function of xenobiotic receptors. Xenobiotic receptors, Pregnane X Receptor (PXR), Constitutive Androstane Receptor (CAR), Energy metabolism, Glucose metabolism, Lipid metabolism.